I’m adding another blog to which I will occasionally be adding pieces. Whatever else I may be writing about, I believe the stuff there will reflect my greatest passion: the need for me, you, all of us- all of humanity- to begin or continue changing the ways we see and understand the Earth and the universe, and our own places within them. All I can do, all any of us can do, is let loose memes into the imaginations of each other, and pray that some of them take root, and grow. Our old answers have cumulatively led to a world on the brink of nuclear and/or biological catastrophe. It is time to either re-think our viewpoints, or remember the attitudes buried deep within our DNA that enabled humankind to flourish cooperatively with the Earth for over a million years. The underlying reasons for my doing this blog- Thou– and for the mindset which gave rise to it, are what follows. However you can help me understand and participate in this Great Story, as Thomas Berry has called it, please let me know. Martin Buber’s book, I and Thou, published in 1923, examined the language of interpersonal relationship and dialogue, and how that attitudinal language can affect the nature of our personal realities. He said that humans have the opportunity of adopting one of two attitudes about themselves in relation to their world: I- Thou, or I- It. The I- Thou relationship involves the individual engaging the world in its entirety. That relationship does not isolate the individual within a special set of circumstances and characteristics; rather, the individual is in a dialogue, a mutually enhancing, learning and growing relationship with everything, with all people and all things. The I- It attitude isolates the individual into a special, usually higher category of circumstances, which makes an equally and mutually beneficial relationship between that individual and their world, more difficult. That attitude is the gateway to all types of exploitation, abuse, and injustice, as the individual is prone to regard all of that which is outside of himself, as lesser than himself. I am not a philosopher. I can barely hang onto most philosophical treatises and esoteric philosophical discussions. But Buber’s ideas resounded in me the moment I first read of them, many years ago. I began to feel a sense of liberation, which continues and expands to this day, from attitudinal chains around my mind and heart that would bind me to a particular role or place; from color-leeching filters over my eyes that kept the world’s true vibrancies from being seen by me; and from particular lies of self-perception that were hindering the world’s love for me, and my own love for the world. To be in dialogue with the world is not easy for anyone who lives within the predominate cosmology of the day, even as we are aware and learning about that cosmology. It has shaped us, as worldviews have always shaped the consciousness of humans, even as human consciousness is shaping, or reinforcing, the predominate worldview. Humans have a long, long history of regarding themselves as set apart and special, the apex of a Creator’s intentions and artistry. But they have a much longer history, before that present and predominate worldview, of regarding themselves as arising from, in communion with, and vital to the world, as the world was to them. I believe that that ancient interaction with our environment- with other humans, animals, the seas, the trees, and all things, in community- is our true nature. And it is in re-establishing that dialogue, that regard, with all that is, that we as a species will be able to survive. Our course, right now, is one hell-bent in opposition to, and exploitation of, all that is It. We must begin, and many have, to speak to the world and the universe as we would speak to those most intimate to us- as Thou. Credo- part of it, anyway.. This is a comment I made to another blog, Whitticisms. I include it here, because it describes some of my underlying motivations for doing this blog.. When I was a child, I believed food came from my parents, I didn’t care or need to know how. As long as they were alive and able, there might have been no need for me know otherwise. But I was curious. Grocery stores were the next answer. More curiosity led to farms and ranches, and elaborate transportation systems. Further curiosity took me into plant and animal sciences, and now- at 57, and not a scientist- I see the sources of that food, and all things, in the exploding stars and formations of new galaxies. I am also sure there is more and more to be discovered. I have heard so many people, and have even collected some recordings from the Creation Institute in Glen Rose, saying they believe in Creationism because “it is easier to believe than evolution.” Indeed it is; in exactly the same way it was easier intellectually to believe that food came from my parents. The frontal lobes of human brains, however, will not allow humans to stop wondering and asking questions. So I kept looking for the origins of food, just as specialists look for other things and, thank God, in the case of the polio virus and other maladies, find them. Intellectual pursuits can be stopped by religionists who make the imagination and the asking of too many and too deep questions, into sins, in an attempt to “protect” their territories. The Dark Ages of the Church are historical proof of that! They told others that it was vital to believe only what they could see- a flat earth, an earthcentric universe- because that is all the ancients who spoke Creation stories could see. Well, again thank God, not all of their ’subjects’ bought into that nonsense. I cannot make God fit into my limited abilities to speak of God. Neither could Moses. If I think I can define God by what I know today, let alone what the Hebrews of 1500 BCE knew, then I will either be terribly surprised by new information coming in tomorrow, or I will have to disregard- play dumb- about that information, and take the “easier” route through it. A Demonic Rant, or..one more thing I HATE about religion.. I became a Christian in 1984. At that time, there was great hub-bub on both “Christian” and secular media about Satanic rituals and the attendant child abuse allegedly happening with great frequency around the United States. As a new Christian, in a job in which I was in the car much of the day, I listened to the radio and lapped that stuff up. I’ve spent many years since spitting it all back out. It turned out the whole Satanic Ritual Abuse scare was nonsense. It was founded almost solely on the imaginations of authors who discovered a real, ready, and gullible market for books that somehow confirmed for millions of book buyers that, if Satan was real, then their God must be real, too! Books like Michelle Remembers, Satan’s Underground, and The Satan Seller gave millions of grasping believers the confidence that their fight was a good one and that their God was vulnerable, and needed their help. One by one, these books were exposed to be false, usually by more reputable Christian publications. Their authors were taking shreds of childhood memories and making the rest up. They were lying for the glory of speaking to thousands of hungry church-goers and, not incidentally, for quick and easy access to those listeners’ wallets and purses. Some psychotherapists became envious of the spiritual gravy train rolling through town and came up with an elaboration of Freud’s Repressed Memories, called Recovered Memories, which enabled them to lead troubled adults backward in time to recover “memories” of their own Satanic Ritual Abuse. Thousands of families were wrongfully torn apart, hundreds of innocent people, particularly daycare workers, were wrongfully prosecuted, and all of Christendom took another hit (and rightfully so) for jumping uncritically, even enthusiastically, into the quagmire of this nonsense. There’s much more I want to rant say about this, including special mention of the Grand Kontinuing Kleagle perpetuating this nonsense, Bob Larson; who, in my days of flirting with fundamentalism, I actually sent $40 to, in the absurdly mistaken notion that I was helping finance the cause of Christ. Turns out, I was more likely helping finance one of Larson’s vacations with his mistress-of-the-month. C’est la vie. I have amends to make.. I was watching the movie “Children of Man” last night and heard this song used in the score. There is no video here, just music. And such music.. I will miss their song. 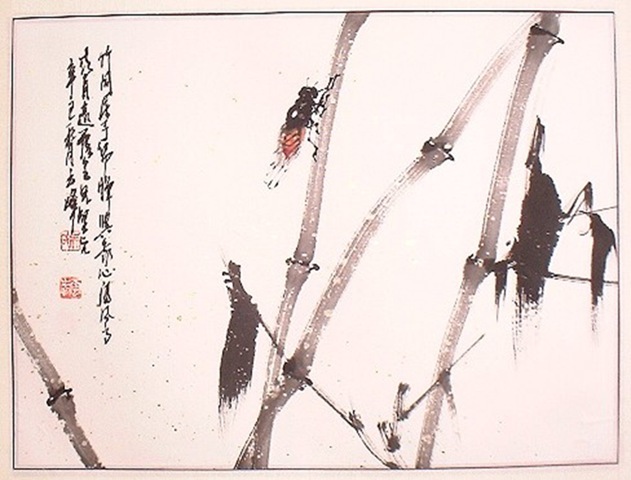 The cicada’s season in the sun and on the branches of trees, is coming to an end now. Each day, there are fewer and fewer of the long, vibrating drones- one cicada signaling another of their procreative nearness, of their one, only, and final desire for the companionship of another. Yet, even now, the final cicada songs are being sounded with vigor and enthusiasm: they are songs of LIFE. There are no beginnings to be heard in those songs, and certainly no endings: only the purest of be-ing. It is an awareness without the encumbrances of memory or imagination, no regrets or hope. It, simply, is. I dare to call it, in my own human complexities, an enviable state of being. It is that place where the humans we admire most (think about it) spend the majority of their moments. When you are with them, they are with you; you do not perceive them to be remembering who you were yesterday, or what you are becoming tomorrow. They hear you, now. They see you, now. You are these moments to them. That’s what the cicada’s song reminds me of each year. Being is better than remembering, though remembering is good and precious. Being is better than planning, though planning is necessary and enhancing to our lives. Being is certainly better than regretting what is past, or being anxious about what is to come. Being allows us to not only hear and see what is around us, but to be part, a vibrant part, of that place we are in, that person we are with, those circumstances in which we find ourselves. It allows us to breathe and renew and to be nourished and active. Our Being is our affirmation, if we allow it to be, of all of Life which preceded us yet is still a part of us (no beginnings) and of all of Life which will come after us, and which we will have influenced for eternity (no endings). It is our song, a song which can be heard in gratitude by others and sung in celebration by us. It is the harmonious chorus we sing with the cicadas, and with all else that lives. “O Lord our Father, our young patriots, idols of our hearts, go forth to battle-be Thou near them! With them, in spirit, we also go forth from the sweet peace of our beloved firesides to smite the foe. O Lord our God, help us to tear their soldiers to bloody shreds with our shells; help us to cover their smiling fields with the pale forms of their patriot dead; help us to drown the thunder of the guns with the shrieks of their wounded, writhing in pain; help us to lay waste their humble homes with a hurricane of fire; help us to wring the hearts of their unoffending widows with unavailing grief; help us to turn them out roofless with their little children to wander unfriended the wastes of their desolated land in rags and hunger and thirst, sports of the sun flames of summer and the icy winds of winter, broken in spirit, worn with travail, imploring Thee for the refuge of the grave and denied it-for our sakes who adore Thee, Lord, blast their hopes, blight their lives, protract their bitter pilgrimage, make heavy their steps, water their way with their tears, stain the white snow with the blood of their wounded feet! We ask it, in the spirit of love, of Him Who is the Source of Love, and Who is ever-faithful refuge and friend of all that are sore beset and seek His aid with humble and contrite hearts.